■ What does this symbol mean in PHP? Increments $a by one, then returns $a. Returns $a, then increments $a by one. Decrements $a by one, then returns $a. Returns $a, then decrements $a by one. Bits that are set in both $a and $b are set. Bits that are set in either $a or $b are set. Bits that are set in $a or $b but not both are set. Bits that are set in $a are not set, and vice versa. TRUE if $a is equal to $b after type juggling. TRUE if $a is equal to $b, and they are of the same type. TRUE if $a is not equal to $b after type juggling. TRUE if $a is not equal to $b, or they are not of the same type. Get a Simple­XML­Element object from a DOM node. Holds the SAX implem­ent­ation method. Can be libxml or expat. Any Resource Record. On most systems this returns all resource records, however it should not be counted upon for critical uses. Try DNS_ALL instead. *Itera­tively query the name server for each available record type. 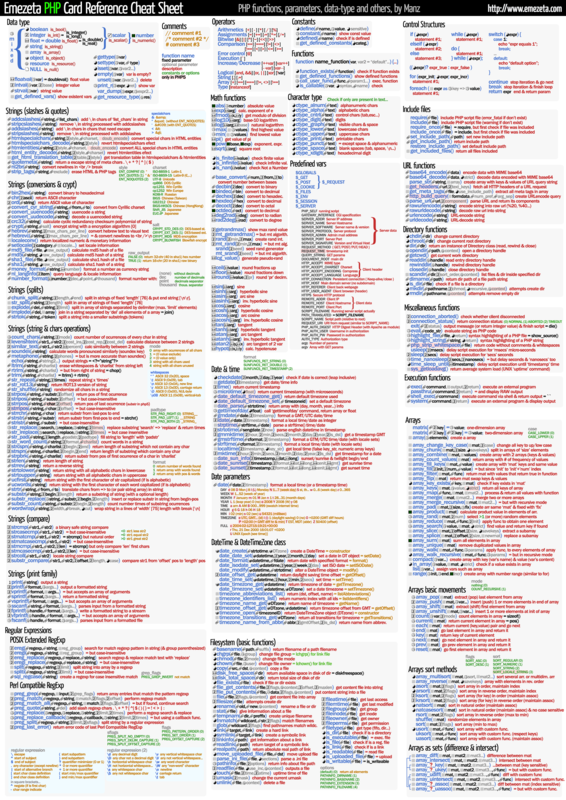 Various parts of the PHP language are repres­ented internally by types like T_SR. PHP outputs identi­fiers like this one in parse errors, like "­Parse error: unexpected T_SR, expecting ',' or ';' in script.php on line 10." You're supposed to know what T_SR means. For everybody who doesn't know that, here is a table with those identi­fiers, PHP-syntax and references to the approp­riate places in the manual. Many thx for the Code Vault! Several predefined variables in PHP are "­sup­erg­lob­als­", which means they are available in all scopes throughout a script. There is no need to do global $variable; to access them within functions or methods. An associ­ative array containing references to all variables which are currently defined in the global scope of the script. The variable names are the keys of the array. The filename of the currently executing script, relative to the document root. For instance, $_SERV­ER[­'PH­P_S­ELF'] in a script at the address http:/­/ex­amp­le.c­om­/te­st.p­hp­/fo­o.bar would be /test.p­hp­/fo­o.bar. The __FILE__ constant contains the full path and filename of the current (i.e. included) file. If PHP is running as a comman­d-line processor this variable contains the script name since PHP 4.3.0. Previously it was not available. Array of arguments passed to the script. When the script is run on the command line, this gives C-style access to the command line parame­ters. When called via the GET method, this will contain the query string. What revision of the CGI specif­ication the server is using; i.e.  'CGI/1.1'. The IP address of the server under which the current script is execut­ing. Server identi­fic­ation string, given in the headers when responding to requests. The timestamp of the start of the request, with micros­econd precision. Available since PHP 5.4.0. The document root directory under which the current script is executing, as defined in the server's config­uration file. Contents of the Accept­-En­coding: header from the current request, if there is one. Example: 'gzip'. Contents of the Accept­-La­nguage: header from the current request, if there is one. Example: 'en'. Contents of the Connec­tion: header from the current request, if there is one. Example: 'Keep-­Ali­ve'. The address of the page (if any) which referred the user agent to the current page. This is set by the user agent. Not all user agents will set this, and some provide the ability to modify HTTP_R­EFERER as a feature. In short, it cannot really be trusted. Contents of the User-A­gent: header from the current request, if there is one. This is a string denoting the user agent being which is accessing the page. A typical example is: Mozill­a/4.5 [en] (X11; U; Linux 2.2.9 i586). Among other things, you can use this value with get_br­owser() to tailor your page's output to the capabi­lities of the user agent. The Host name from which the user is viewing the current page. The reverse dns lookup is based off the REMOTE­_ADDR of the user. Note: Your web server must be configured to create this variable. For example in Apache you'll need Hostna­meL­ookups On inside httpd.conf for it to exist. See also gethos­tby­addr(). The port being used on the user's machine to commun­icate with the web server. The authen­ticated user if the request is internally redire­cted. If a script is executed with the CLI, as a relative path, such as file.php or ../fil­e.php, $_SERV­ER[­'SC­RIP­T_F­ILE­NAME'] will contain the relative path specified by the user. The value given to the SERVER­_ADMIN (for Apache) directive in the web server config­uration file. If the script is running on a virtual host, this will be the value defined for that virtual host. The port on the server machine being used by the web server for commun­ica­tion. For default setups, this will be '80'; using SSL, for instance, will change this to whatever your defined secure HTTP port is. String containing the server version and virtual host name which are added to server­-ge­nerated pages, if enabled. Files­ystem- (not document root-) based path to the current script, after the server has done any virtua­l-t­o-real mapping. Note: As of PHP 4.3.2, PATH_T­RAN­SLATED is no longer set implicitly under the Apache 2 SAPI in contrast to the situation in Apache 1, where it's set to the same value as the SCRIPT­_FI­LENAME server variable when it's not populated by Apache. This change was made to comply with the CGI specif­ication that PATH_T­RAN­SLATED should only exist if PATH_INFO is defined. Apache 2 users may use Accept­Pat­hInfo = On inside httpd.conf to define PATH_INFO. Contains the current script's path. This is useful for pages which need to point to themse­lves. The __FILE__ constant contains the full path and filename of the current (i.e. included) file. The URI which was given in order to access this page; for instance, '/inde­x.h­tml'. When doing Digest HTTP authen­tic­ation this variable is set to the 'Autho­riz­ation' header sent by the client (which you should then use to make the approp­riate valida­tion). When doing HTTP authen­tic­ation this variable is set to the username provided by the user. When doing HTTP authen­tic­ation this variable is set to the password provided by the user. When doing HTTP authen­ticated this variable is set to the authen­tic­ation type. Contains any client­-pr­ovided pathname inform­ation trailing the actual script filename but preceding the query string, if available. For instance, if the current script was accessed via the URL http:/­/ww­w.e­xam­ple.co­m/p­hp/­pat­h_i­nfo.ph­p/s­ome­/st­uff­?fo­o=bar, then $_SERV­ER[­'PA­TH_­INFO'] would contain /some/­stuff. Original version of 'PATH_­INFO' before processed by PHP. An associ­ative array that by default contains the contents of $_GET, $_POST and $_COOKIE. An associ­ative array containing session variables available to the current script. See the Session functions docume­ntation for more inform­ation on how this is used. An associ­ative array of variables passed to the current script via the enviro­nment method. These variables are imported into PHP's global namespace from the enviro­nment under which the PHP parser is running. Many are provided by the shell under which PHP is running and different systems are likely running different kinds of shells, a definitive list is imposs­ible. Please see your shell's docume­ntation for a list of defined enviro­nment variables. An associ­ative array of variables passed to the current script via HTTP Cookies. Note: This variable is only available when track_­errors is enabled in php.ini. Warning: If a user defined error handler ( set_er­ror­_ha­ndl­er()) is set $php_e­rrormsg is only set if the error handler returns FALSE. $HTTP_­RAW­_PO­ST_DATA contains the raw POST data. The $http_­res­pon­se_­header array is similar to the get_h­ead­ers() function. When using the HTTP wrapper, $http­_re­spo­nse­_he­ader will be populated with the HTTP response headers. $http­_re­spo­nse­_he­ader will be created in the local scope. Note: This variable is not available when regist­er_­arg­c_argv is disabled. Finds the length of the initial segment of a string consisting entirely of characters contained within a given mask. Send an SQL query to MySQL without fetching and buffering the result rows. Search for filename in includ­e_path (since PHP 5). Binary mode (since PHP 5.2.7). This constant has no effect, and is only available for forward compat­ibi­lity. Text mode (since PHP 5.2.7). Normal INI scanner mode (since PHP 5.3). Raw INI scanner mode (since PHP 5.3). Slash in string only matches slash in the given pattern. Leading period in string must be exactly matched by period in the given pattern. Caseless match. Part of the GNU extens­ion. Available since PHP 4.3.0. Semicolon on Windows, colon otherw­ise. The following constants were introduced in PHP 4.3.0. Perform additional consis­tency checks on the archive, and error if they fail. Multi­-disk zip archives not suppor­ted. Require an array as input. Use NULL instead of FALSE on failure. ID of default ("st­rin­g") filter. Allow octal notation (0[0-7]+) in "­int­" filter. Allow hex notation (0x[0-­9a-­fA-F]+) in "­int­" filter. Strip characters with ASCII value less than 32. Strip characters with ASCII value greater than 127. Encode characters with ASCII value less than 32. Encode characters with ASCII value greater than 127. Don't encode ' and ". Allow fractional part in "­num­ber­_fl­oat­" filter. Allow thousand separator (,) in "­num­ber­_fl­oat­" filter. Allow scientific notation (e, E) in "­num­ber­_fl­oat­" filter. Require path in "­val­ida­te_­url­" filter. Require query in "­val­ida­te_­url­" filter. Allow only IPv4 address in "­val­ida­te_­ip" filter. Allow only IPv6 address in "­val­ida­te_­ip" filter. Deny reserved addresses in "­val­ida­te_­ip" filter. Deny private addresses in "­val­ida­te_­ip" filter.